Pioneer 10 and 11 launched in the year 1972 and 1973 respectively, were the first spacecraft to visit the solar system’s most photogenic gas giants Jupiter and Saturn. This space exploration project was conducted by the NASA Ames Research Center in California. Pioneer 10 became the first spacecraft to traverse the Asteroid Belt (Field of orbiting rocks between Mars and Jupiter) between 1972 and 1973. Photography of Jupiter began on 6th November 1973, at a range of 25,000,000 kilometers and images were successfully received back via the Deep Space Network. Pioneer 10 also confirmed that the Jupiter’s Magnetic Field was inverted as compared to earth. It sent some brilliant coloured photographs of the giant planet including the Giant Red Spot! It performed a close flyby of the planet and all of its moons. Pioneer 11 was launched by NASA the next year to study the Asteroid belt, Jupiter and Saturn. The spacecraft was one of the first man made object to study Saturn and its moon. Pioneer 10 and 11 are two of the five spacecrafts to achieve escape velocity that will allow it to leave the Solar System and travel towards the Interstellar space. Due to power constraints the Pioneer Missions stopped sending back data on September 30,1995. Shortly after Pioneer made their flybys, Voyager 1 and Voyager 2 followed to study the solar system. They were launched in 1977 to take advantage of a favourable alignment of Jupiter, Saturn and Uranus and is now exploring the outer boundary of the heliosphere in the Interstellar Space. On 25th of August 2012, the data indicated that Voyager 1 became the first ever Human Made object to enter the interstellar space “further than anyone, further than anything in the history”. Voyager 1 is still moving further with a velocity of 17km/second. They made many important discoveries about Jupiter and Saturn, including rings around Jupiter and the presence of volcanism on Jupiter’s moon, Io. Voyager went on to make the first flybys of Uranus, where it discovered 10 new moons, and Neptune, where it found that Neptune actually weighs less than astronomers thought. Both Voyager crafts have enough power to keep transmitting radio signals until at least 2025! Voyager 2 is currently the farthest man-made object from Earth, at more than a hundred times the distance from the Earth to the sun, and more than twice as far as Pluto! The voyager spacecrafts were built by NASA’s Jet Propulsion Laboratory in Southern California. Among many images taken by the Voyager 1, This is one of the most popular image known as the “Pale Blue Dot” and popularized by Carl Sagan in his quote..
“Consider again that dot. That’s here. That’s home. That’s us. On it everyone you love, everyone you know, everyone you ever heard of, every human being who ever was, lived out their lives. The aggregate of our joy and suffering, thousands of confident religions, ideologies, and economic doctrines, every hunter and forager, every hero and coward, every creator and destroyer of civilization, every king and peasant, every young couple in love, every mother and father, hopeful child, inventor and explorer, every teacher of morals, every corrupt politician, every “superstar,” every “supreme leader,” every saint and sinner in the history of our species lived there – on a mote of dust suspended in a sunbeam”. Both the Voyager Missions Carry a Golden Record that contains pictures and sounds of Earth and symbolic directions of playing the record and location of our planet. This is an interstellar message to any civilization, alien or far future human that may recover the spacecraft. The Wilkinson Microwave Anisotropy Probe was launched in 2001 from Florida developed in a joint space mission between NASA Goddard Space Flight Center and Princeton University. The spacecraft operated from 2001 to 2010 and measured with unprecedented accuracy the temperature differences across sky in the Cosmic Microwave Background- The Radiant Heat from the Big Bang. WMAP’s measurements played a key role in establishing the current standard model of Cosmology: The Lambda-CDM Model. It heralded a leap forward in the cosmological theories of origin of universe. WMAP also revealed a much more precise age of the universe at 13.7 Billion years and confirmed that 95% of it is composed of poorly understood things called Dark Matter and Dark Energy. The results of the mission won the Science Magazine’s Breakthrough of the Year 2003 Award! Spitzer Space Telescope is another spacecraft with a profound effect on Astrophysics and Cosmology. It was the fourth and final of the NASA’s Great Observatories Program launched on 25th August 2003 from Cape Canaveral. In addition to taking gorgeous photos of galaxies, nebulae and stars, the telescope has made numerous groundbreaking scientific discoveries. It became the first telescope to capture light from Exosolar Planets in 2005. In 2004, It was reported that Spitzer spotted a faintly glowing body that maybe from one of the first born star in the universe. In March 2006, astronomers reported an 80-light-year long nebula near the center of the Milky Way Galaxy, the Double Helix Nebula, which is, as the name implies, twisted into a double spiral shape. This is thought to be evidence of massive magnetic fields generated by the gas disc orbiting the supermassive black hole at the galaxy’s center, 300 light-years from the nebula and 25,000 light-years (7,700 pc) from Earth. This nebula was discovered by Spitzer and published in the Nature on 16 March 2006. 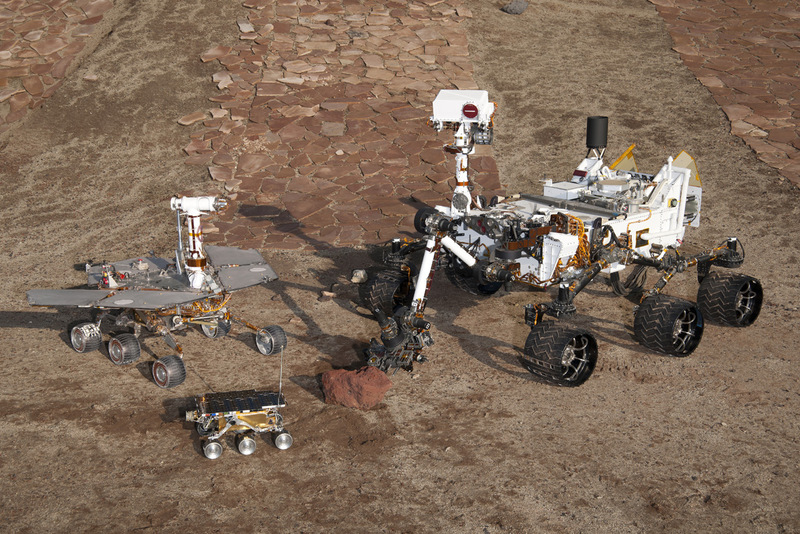 It is a Mars Exploration programme involving two robots named Spirit and Opportunity launched in the year 2003. Initially, It was intended for a 90 days mission but both the rovers outlived their plan- Spirit was active until 2010 whereas Opportunity is still active! The probes landed in January 2004 on opposite sides of the planet and since then they are exploring the craters and hills of the Red planet, travelling all over the surface. There were initial glitches in the operation of Spirit as the Deep Space Network lost contact with the spacecraft, however, NASA Engineers managed to fix the glitch and restored communications in 10 days and it returned to a full scientific operation! On March 2004, it came up with a Major Discovery indicating the evidence of Past Liquid on the Maritan Surface. Also, the irregular distribution of chlorine and bromine suggested that the place was once a shoreline and now evaporated. Spirit managed to climb the summit of Husband Hill and opportunity successfully entered the Victorian Crater. On May 16,2013 Opportunity had driven further than any other NASA Vehicle in another world with a odometry of 35.744 Kilometer. As per the latest data, opportunity has covered a distance of 42Km!! The rover explored the Columbia hills and studied the types of rocks in details. However, Spirit and Opportunity are popular for their collection of large evidences indicating a past presence of water in the planet! Cassini Huygens was a joint NASA, ESA and Italian Space Agency Mission launched in the year 1997 and reached its destination Saturn in 2004. It was a probe sent to study Saturn and its rings and natural satellites. The Unmanned Robotic Spacecraft comprised of the Cassini probe and ESA’s Huygens Lander which landed on Titan- The Saturn’s Largest moon! The voyage to Saturn included the flyby of Venus, Earth, Asteroid 2685 Masursky and Jupiter. Its mission ended on September 15, 2017 (recently) when Cassini was commanded into the upper atmosphere of Saturn and burn up. NASA’s Cassini mission revolutionized the Human Understanding of Saturn and its rings and our understanding of where life may be found in the Solar System. It was originally planned to last 4 years, however it was extended upto a period of 7 years! The Huygens module landed on Titan with the help of a parachute on January 14, 2005. It was the first landing on a moon other than our own. At the end of the mission, Cassini performed a number of risky manoeuvres between the rings of the planet to maximise its scientific outcome before the atmospheric entry ended the mission. Venus and Earth Flybys and cruise to Jupiter: These flybys provided enough momentum for the spacecraft to travel towards the asteroid belt. It took various images of Venus and Earth’s Moon! New Moons of Saturn: It discovered 7 new moons orbitting the saturn. Phoebe Flyby: It is believed that a large amount of water ice exists under the surface of phoebe. Titan Flybys: It discovered the methane clouds over the surface of the moon. A lot of detailed images of the moon were captured! Enceladus Flyby: It discovered a local deflection in the magnetic field which indicated a presence of atmosphere consisting of ionized water vapours. It also observed water ice geysers erupting from the south pole of the moon. NASA reported evidence of a large salty internal ocean of liquid water in Enceladus and was among the most probable places to host Alien Microbial Life!!! Radio Occultations of Saturn’s Rings: It studied the rings of saturns in detail and helped to provide never before seen data! Lakes of Titans: Radar images obtained in 2006 show the lakes of Liquid Hydrocarbon in titan. This is the first discovery of a lake outside of our planet earth! Great Storm: It studied the great storm of saturn which occurs once in every 30 Years! The Day the Earth Smiled..
On July 19, 2013, the probe was pointed towards Earth to capture an image of the Earth and the moon as part of a natural light, multi-image portrait of the entire Saturn system. The event was unique as it was the first time NASA informed the public that a long-distance photo was being taken in advance. The imaging team said they wanted people to smile and wave to the skies, with Cassini scientist! The day the earth smiled. Source: NASA/JPL. Cassini’s end involved a series of close saturn passes approaching within the rings and entry into the Saturn’s Atmoshpere in September 15, 2017 to burn the spacecraft. This was done to prevent any contamination to the moons potentially offering habitable conditions! NASA’s Deep Space Network received the last transmission at 7:55:46AM EDT marking the end of an epic 19-year space mission. Stay tuned to our blog for the Part 2 of “NASA’s 10 Most Popular Space Explorations”..